painting Description This is Tanjore Style Glass Painting in which precious metals like gold, sliver and precious gems are used. The canvas is made of glass. It is also a very popular Style of painting style in India. 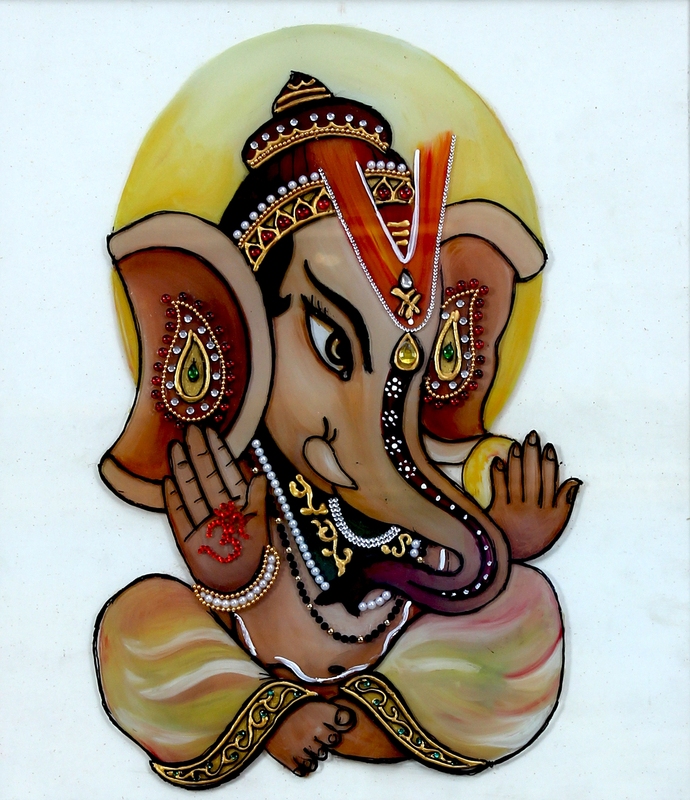 In this Glass Painting, the artist has tried to make a picture of Lord Ganesha. In this picture the artist has painted the picture of Child Lord Ganesha and priority has given to his face. Diemensions ( Length X Width X Height ) 12"x10"x1"
Customizable? Yes, Please call us to confirm. The artistic nature and undeniable glory of these paintings will uplift the overall beauty of your walls. The plain and boring walls will ooze out charm and vibrancy as you install these creatively designed paintings. Inspired from unique thoughts and designed in an artistic way, these paintings will give your surroundings an indigenous and dramatic appeal. A one stop-shop for home decor and furniture, We sell a home product every 30 seconds. In case of any concerns, please send us photographs of the items to ascertain the reason for return which can be initiated from "My Account" section. Once the return is accepted for refund, you would be contacted by our Customer Care team for product collection. You will need to retain the item with all its seals and trappings (boxes,bags, tags, stickers etc.) intact along with the Original Invoice. You can retain a copy of the Invoice for reference and future correspondence. For any further clarifications do get in touch with our friendly customer care folks. No cancellations will be accepted once an order is delivered. 7/108,G-1, Parv Kuti, Behind Mithaas Swaroop Nagar, Kanpur, UP, India.